Ecological economics is an exciting interdisciplinary field of study that combines insights from the natural sciences, economics, philosophy and other fields to develop innovative approaches to environmental problems. It draws on a wide range of analytical perspectives, some radical others more conventional, to build a more complete understanding of human-ecosystem interactions. Current research in the field includes work on nature conservation, land use planning, pollution control, natural resource management, and environmental impact assessment/evaluation. 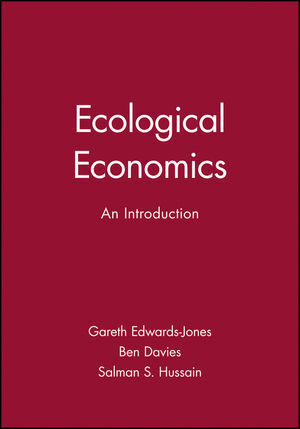 Ecological Economics provides a comprehensive introduction to the core themes, presented in a clearly structured style, with chapters tailored specifically to readers without any economic or philosophical training. There is an emphasis throughout on the complementary roles of economics, ethics and ecology in environmental decision-making processes. The book reviews the evolution of important ideas in the field, explores the fundamental philosophies underlying different approaches to environmental problems, explains in detail the specific tools and techniques used in these approaches, and gives numerous examples of how they can be applied. Special importance is attached to understanding both the advantages and limitations of different analyses, in order to provide a balanced and coherent view of how these different approaches interrelate and how their roles vary in different contexts. Written by three authors specializing in ecology, economics and philosophy, this textbook provides an excellent introduction to the field of ecological economics for students in the natural sciences and other environmental disciplines. It will also be of interest to a wide range of professionals and researchers involved in environmental management and policy, and thers including economists seeking to broaden their knowledge of new methodologies and approaches. Further reading suggestions and extensive references are provided for those interested in pursuing particular themes beyond the introductory level. The first introductory ecological economics text written specifically for natural scientists. Assumes no prior knowledge of economics or philosophy. Emphasises the complementary roles of ecology, economics and ethics in environmental decision-making processes. An emphasis on clarity and accessibility throughout. Gareth Edwards-Jones has posts as Professor of Agriculture and Land Use in Bangor University, UK and as the Waitrose Professor of Sustainable Agriculture at Aberystwyth University, UK. His works centres on three themes: greenhouse gas emissions from agriculture, economics of nature conservation and the economics of disease in the food chain. Part I: Foundations for Ecological Economics:. 2. A Brief History of Ecological Economic Thought. 3. Economic Principles for Non-economists. 4. Ethics and Environmental Philosophy. Part II: Value and Valuation Tools:. 5. The Concept of Value. 6. The Economic Approach to Environmental Valuation. 7. The Ecological Approach to Environmental Evaluation. Part III: Frameworks for Decision-Making:. Part IV: Applications: Theory and Practice:.